Here we are, hauling ourselves out of the Christmas and New Year holidays and into January proper. It’s dawning on me that I have to go back to work, even though it’s still very cold and gloomy in northern Europe, and even though my duvet is lovely and warm. I found myself envying beings that hibernate, and thinking about beings that hibernate, and searching for things to do with hedgehogs. And, well, the long and the short of it is, today’s blog post is a short meditation on the hedgehog cam. 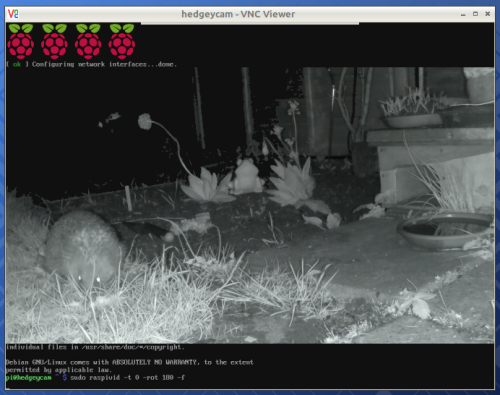 Someone called Barker has installed a Raspberry Pi–based hedgehog cam in a location with a distant view of a famous Alp, and as well as providing live views by visible and infrared light for the dedicated and the insomniac, they also make a sped-up version of the previous night’s activity available. With hedgehogs usually being in hibernation during January, you mightn’t see them in any current feed — but don’t worry! You’re guaranteed a few hedgehogs on Barker’s website, because they have also thrown in some lovely GIFs of hoggy (and foxy) divas that their camera captured in the past. For pointers on how to replicate this kind of setup, you could do worse than turn to Andrew Wedgbury’s hedgehog cam write-up. Andrew’s Twitter feed reveals that he’s a Cambridge local, and there are hints that he was behind RealVNC’s hoggy mascot for Pi Wars 2017. Our infrared bird box and time-lapse camera resources will also set you well on the way towards your own custom wildlife camera. For a kit that wraps everything up in a weatherproof enclosure made with love, time, and serious amounts of design and testing, take a look at Naturebytes’ wildlife cam kit. Or, if you’re thinking that a robot mascot is more dependable than real animals for the fluffiness you need in order to start your January with something like productivity and with your soul intact, you might like to put your own spin on our robot buggy. While we’re on the subject of getting to grips with the new year, do take a look at yesterday’s blog post, in which we suggest a New Year’s project that’s different from the usual resolutions. However you tackle 2018, we wish you an excellent year of creative computing. I have a NoIR camera module. I have the very same waterproof box. I do have the occasional hedgepig and foxes – mostly damned cats though. And lots of frogs in spring. I’m feeling hedgepigCam coming on….. In this resource you will make a wearable time-lapse camera using a Raspberry Pi Zero.